Animal Defenders International : Animal experiments : European Commission review lab animal laws. Animal Defenders International undertook a relentless campaign to protect millions of laboratory animals across Europe when the Directive governing their use was revised. A decade on, the European Commission has published its review of the amended legislation, Directive 2010/63/EU, following public consultations to which ADI submitted. In the review the Commission highlights the need for greater transparency of information about the use of animals and the need for high standards of relevant education and training to ensure the maximum uptake of replacement, reduction and refinement (3Rs). Key factors holding back fuller implementation of alternatives are identified as a lack of knowledge, insufficient communication, the acceptance of alternatives and financial aspects. ADI has been urging the Commission to implement Thematic Reviews, which would allow systematic and critical examination of the scientific justification for targeted animal experiments. These would establish whether animal experiments should be abandoned, due to poor science and relevance or because an advanced non-animal alternative is already available. This was adopted under Article 58 of the Directive and is a realistic mechanism for replacing the use of animals in research, but has yet to be implemented. It is immensely disappointing that the Commission has ruled out setting a strategy and timeframe for ending the use of non-human primates, their decision based on a review of primate use which has been criticised for being biased and unscientific. 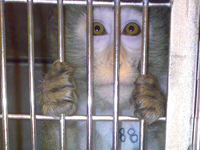 In 2007 the European Parliament adopted Written Declaration 40, which was drafted by ADI and called for the establishment of a timetable to replace the use of primates in scientific experiments; ten years on, no progress has been made. ADI will continue to push for the adoption of advanced non-animal methods of research to be used – more effective and reliable, and saving animals’ lives. Contact your MP and MEP and call on them to champion the adoption of modern methods. Sign up to our email alerts to keep informed of our campaigns for animals.